As a veteran character animator, I was beginning to doubt whether I’d ever again have the opportunity to create a short narrative piece – then I got the call. When Google calls and says, ‘We’d like you to drop everything and make a short narrative piece that will be seen by hundreds of millions of people’, you heed that call! Since the dot com crash I, like many of my Flash animation contemporaries, have been content to reboot my career to a trade less concerned with storytelling and more concerned with making online game characters perform repeatable incremental actions. It’s a fine living, but the urge to tell a story, even a simple one, is what drives most animators to continue to create. I have always been humbled by watching my fellow animators working insane hours on their own time to try and squeeze a few more ”story beats” into the opening cutscenes of the game they’re working on. I’ve done it myself many times. It’s the creamy center of any game production job: designing/storyboarding/(and if you’re lucky) animating the intro sequence: a mini-movie for all of 20 seconds. Unlike the dot com glory days when animators had full time work telling stories for well-paying online patrons, these days working to create short pieces comes at a steep price: you must fund your animation independently out of your own pocket. Then it’s up to you to market, advertise, and, against-all-odds, try to squeeze some money out of the whole endeavor. It dissuades a lot of potential storytellers. And yet hope springs eternal. My call came on a Tuesday. 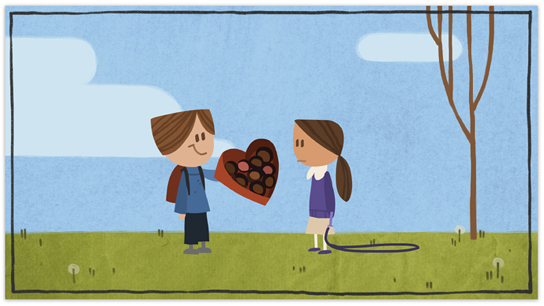 After a whirlwind of pre-production calls, on-campus meetings, and massive file transfers, I found myself working on Google’s first ever long-form animation: a Valentine’s Day “Google Doodle”! I was working from the inspiring design paintings of Willie Real in the Doodle dept. Willie has recently returned to the Bay Area from Blue Sky Studios feature animation studios in New York. He has a great feel for story beats and honest emotion. Animation is generally timed to a soundtrack, and for this piece, what a track we had: the legendary Tony Bennett crooning his 1951 version of the Hank Williams nugget, “Cold, Cold Heart”. (Luckily I am a huge fan of both Williams and Bennett, which is good because I had to listen to that track more times that I can count). So after all of the late night work sessions and early morning conference calls, my valentine is complete. I’ll be taking my lovely wife out to dinner tonight to celebrate. 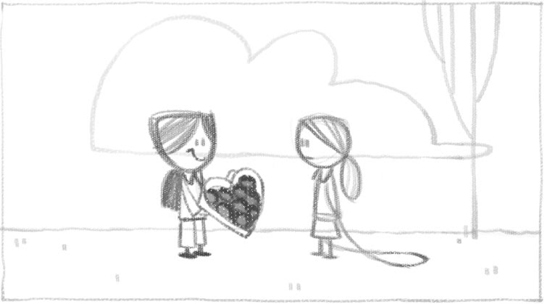 But I can’t help being surprised that in working on this project, I too was courted. It was a sweetheart of a deal: I got paid to tell a story to the world again. Many thanks to all of my friends on the Google Doodle team especially Ryan Germick & Willie Real. It’s Willie’s “retro-current” designs that really make this piece. To see more of Th’ Lip’s animation go to LIPPY.com! Michael: Henry and I saw the article in the Lancaster Newspaper. Mazel Tov. Glad things are going well. Regards to your sister, too. Loved it! Very simple, yet still moving, little piece. Thank you for the compliment, Stefan! I saw your artwork, very fluid and eye catching. I would like to present a friend of mine who works as an illustrator in the San Francisco area, you may know him as he also does comics too, Nate Van Dyke. If you don’t, I have inserted his illustration online portfolio site and contact info. You will not be wasting your time visiting his portfolio site. I meet this prolific, creative individual, Nate (N8) Van Dyke. He has an extensive online portfolio on Facebook (https://www.facebook.com/N8VanDyke) as well as several “YouTube” illustration videos. I am sending out his information so you can review his freelance work. He is an excellent artist, gracious and has a strong online network of followers. His work covers several style types, but don’t be put off by the “edgy” work. He is also on my Linked in site. Thank you for reviewing Nate (N8) awesome illustrations and artwork. Thanks for the lead on Nate. Lippy- wonderful timing – heartfelt and brings a smile! This is absolutely wonderful! I remember this doodle and have to say, it was one of my favorites. We are currently looking for an animation/sketch artist to partner with us to tell a human trafficking survivor’s story. Do you have any information for us to contact you directly to talk about the project? Awesome, Lippy! I have been out of touch for quite some time and I just checked out your site to find out that you were the one behind this cool animation. I remember watching it on Valentine’s Day 2012, the same day I proposed to my wife! I can’t help but think that you played a part in my little love story. I hope you get to do more work like this. I miss the stuff of years past. Congratulations on your marriage, Andre! Yes – It has been MUCH too long. Let’s plan on getting together over the summer.